The length of a blog post is one of the most debated topics among bloggers and content marketers. 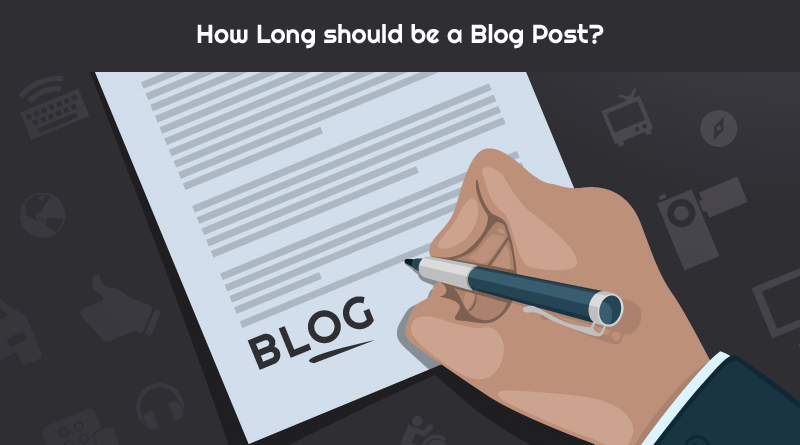 Every now and then we see bloggers asking from experts “What is the perfect length for a blog post?”. You may also have asked it many times and may got different answers because there is no definite answer. For some experts, content should be short and sweet while for others it should be long enough to please users and search engines alike. Reason, it all depends on what you want to accomplish from your blog. However, if someone says “Short is always better” or “Long is always better”, don’t listen to them. Instead look on the purpose for which you have created your blog. The proponents of short posts usually say that people have short time span on internet. They don’t have time to read complete posts. But remember, people will read if you are giving them what they actually want to read, irrespective of word count. For each of these purposes, you have to think differently and decide your blog length accordingly. Before you debate on length of the blog post, keep in mind that whatever length is, content of the blog must be meaningful and useful for users. Otherwise, you will never be able to accomplish your blog mission. Let’s see what should be the preferable blog post length for each of these purposes. Do you want to invoke discussion and get comments? If your only purpose is to get more comments or invoke discussion, then a short and meaningful text from 200 to 300 words will serve it. This is true in case of newspaper stories where you have limited amount of information to share and that is purposed to invoke discussion. However, be clear that with short posts (except News Stories; they are likely to have more shares), you cannot expect much social media shares and higher ranking. But the benefit of building and engaging audience is great. Another important point you must keep in mind is although short but the post should be complete in itself. It should not feel incomplete or lacking information. To get comments and invoke discussions, write a short discussion-based post of about 200 – 300 words. You can put some question before your audience or ask something interesting like a guess game or puzzle. Do you want your post to go viral on social media? Length is an important factor for the post to get hit on social media. A medium length, high quality and useful post (600-1200 words) is perfect to get social shares. Medium length posts are not only best to get social shares but they also serve the purpose of generating discussion on social media platforms. Moreover, they are also good for SEO purposes. Write a great post (600-1200 words) with sensational headline and useful content that solves the user problem in your niche. Traffic is what every blogger wants on its blog. And it would be awesome if that traffic comes from Google. SEO is what people do to get organic traffic from Google. So to get traffic from Google, your post must be in accordance with SEO guidelines. Your blog post must be of considerable length (1200-2000 words) to be noticeable by search engines. Don’t fill your post with useless content just to increase the word count. The blog post must be well-researched with authentic data. A long post may not go viral, it may not invoke discussion but once Google notices it, you will observe a considerable increase in traffic coming to your website. To get more traffic, write a long (1200-2000+ words) post containing authentic information and data. One thing is for sure, that whatever is purpose of your blog, you want to have tons of traffic to it. And for getting traffic, longer posts are reported to have performed better than the short posts in terms of ranking. Content is king. More content, more are the chances of it being ranked higher. Let me explain how it goes. Googlebot, Google’s web crawler, indexes your website. When it indexes, it looks at every single word including page title, heading tags, alt tags and Metadata. So the more content you have on your website, more it will index and being indexed more, your website will perform better in search results. It is that simple! Keywords play an important role in website ranking. Google crawler indexes content on the basis of relevant keywords queried by users. Short posts have less room for keywords while in long posts, you can use variety of keywords and in different combinations that search engines are looking for. A blog post having a variety of keywords performs well as Google’s latest algorithm Rank Brain, delivers semantically related keywords. Means, it not only look for exact keywords but also synonyms and related terms. You can play with keywords only in long posts. For keywords, generally long tail keywords are preferred and long posts are the ones in which you can use long tail keywords in different combinations. Quality Backlinks are necessary for good SEO and for more Backlinks, long posts are recommended. Long post, more backlinks and good SEO. So there are no hard and fast rules for length of a blog post. It mainly depends on what you want your blog to accomplish. However, longer posts are reported to perform well both for readers and for SEO. So if you really want to rank high and capture audience, go for long posts. For SEO consultation and analysis, feel free to contact us.